The Reddy Black Knit Dog Beanie offers your furry family member a look that pairs with your own down-to-earth taste in fashion. 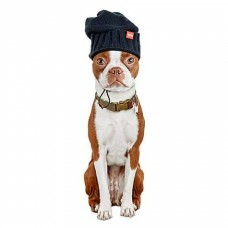 Stitched into a cozy knit that keeps them warm, this dog hat fits snugly with elastic drawstrings and leather-accented toggles. Buying.com is a Technological company that connects people with E-commerce on demand with 30 minute to 2 hour delivery windows. We do this by offering the next genetation of a Decentralized E-commerce Platform along with innovations in Bulk Pricing, Real-time Logistics, E-Commerce and Cryptocurrency.